We brought fifteen monkeys to dance with the Phillie Phanatic. Seven of our monkeys even got up on the dugout and joined our favorite hairy green guy for some good-lovin PHUN later on. 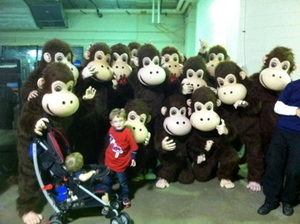 Watch your fans go bananas by booking our prime primates at your next game!